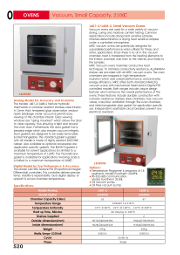 Vacuum ovens are used for a wide variety of vacuum drying, curing and moisture content testing. 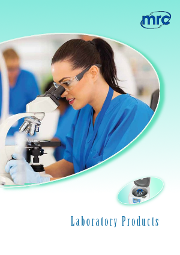 Common applications include drying heat sensitive samples, moisture determination, & drying heat sensitive samples under a controlled atmosphere. 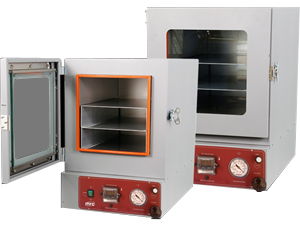 These vacuum ovens are specifically designed for unparalleled performance when utilized for these, and other, applications. Since there is no air in the vacuum chamber, heat is transferred from the heating elements to the interior chamber wall, then to the shelves, and finally to the samples. The Vacuum ovens maximize conductive heat techniques. To minimize conductivity resistance, ALUMINIUM shelves are provided with all the vacuum ovens. The oven chambers are wrapped in high temperature insulation which aids overall performance and promotes energy efficiency. We offer both standard ANALOG vacuum ovens with mechanical thermostat & Digital PID controlled models. Both ranges include unique design features which enhance the overall performance of the ovens. These features include durable construction with corrosion resistance stainless steel chambers, true vacuum valves, cross-flow ventilation through the oven chamber, and interchangeable door gasket for application specific use. Independent, resettable circuit breakers prevent any electrical overload. The Models 1407-2/1408-2 feature hydraulic thermostats & corrosion resistant stainless steel interior. A 13mm thick tempered glass observation window resists breakage under vacuum & permits easy viewing of the chamber interior. Glass viewing windows are "spring mounted" which allows the door to close squarely, thus ensuring a tight seal around the oven door. Furthermore, the door gasket has a beaded edge which also ensures vacuum integrity. Door gaskets are designed to be easily removable & interchangeable. The standard gasket supplied with all models is made of highly resistant SILICONE rubber. Also available as optional accessories are application specific gaskets. The BUNA-N gasket is available for solvent applications & is limited to a maximum temperature of 125°C. The Fluorosilicone gasket is available for applications involving acids & is limited to a maximum temperature of 200°C. The Model 1407DIG feature PID (Proportional IntegralDifferential) controllers. This controller delivers precise temp. stability & repeatability. Dual digital display of setpoint & actual chamber temperature. Temperature Programer 4 programs of 16 segments, Model: Eurotherm 2416P4. RS-232/485 communication. Model: Eurotherm 3216E.